Taking place on August Bank Holiday Monday (25th August), this year's lap of honour is a celebration of some of the UK's finest ever road racers, plus some overseas talent of the highest order, and the line-up includes a combined - and staggering - total of no less than 90 TT victories and 205 TT podiums. The current King of Mountain, McGuinness has now taken an incredible 21 TT wins whilst he's also achieved more podiums - 42 - than any other rider. The outright lap record holder, who will be racing in the 500cc Classic TT, will ride his own 250cc Honda, a replica of the machine upon which he won his first TT race in 1999. One of only two riders to win World titles in the 125cc, 250cc and 500cc categories, Read won 52 GPs and stood on the podium 121 times during his phenomenal career, the latter the fifth highest total of all time. The 8-times World Champion will ride the 500cc RG Suzuki that he campaigned during the 1976 500cc World Championship for Team Classic Suzuki. One of the finest road racers of the 1970s, Mortimer could ride - and win - on all classes of machinery although his greatest success came in the 125cc, 250cc and 350cc categories. An 8 times TT winner, Mortimer will ride a 350cc Yamaha in the Classic TT Lap of Honour. Twice World Formula Two Champion, Reid was a road racer of the highest calibre right up until his retirement in 1994 and with 5 TT wins and 10 podiums, he's still rightly revered amongst the racing fraternity. One of the famed 'Dromara Destroyers', Reid will ride a 500cc RG Suzuki for Team Classic Suzuki similar to what he raced in the 1980s. A former British Champion and multiple winner at the North West 200 and Macau, injury meant Plater only competed at the TT for three years but he certainly made it count with two wins, three podiums and 13 silver replicas from his 13 finishes. A former BSB front-runner, Plater, who won the 2009 Senior TT, will line up on one of the iconic Honda RC45 machines. One of Britain's finest road racers in the 1970s and 80s, Williams was primarily a 250cc and 350cc expert although he also enjoyed strong results on 500cc and F1 machines. A nine times TT winner, Williams took 21 podiums in total and became one of the few riders to win two TT races in a day when he took the Junior and F2 races in 1980. As well as taking part in the Lap of Honour, Williams will also be having his first race on the Mountain Course in 30 years when he contests the 500cc Classic TT. Another rider to have a brief, but spectacular TT career, Crosby finished in fourth place at his first attempt in 1979 and he was immediately snapped up the factory Suzuki team. The next two years saw him rack up three wins, four podiums and become World F1 Champion in both 1980 and 1981. He was also only 0.8s adrift of the outright lap record when winning the 1981 Classic TT and will be on board an identical XR69 Suzuki to what he rode that day. McCallen was very much the man to beat in the big bike classes at the TT during the 1990s and won 11 race wins during his career, including four in 1996 and three in 1997. The Northern Irishman will take part in the parade on board one of his race winning RC45 Honda's. Like Crosby, McElnea only contested the TT for three years but his record is an almost exact replica with three wins and four podiums coming in two of those years, 1983 and 1984. The works Suzuki rider notched up Senior and Classic race wins before he embarked on a successful Grand Prix and then BSB managerial career. He'll also be Suzuki XR69 mounted for the lap of honour. Four times World Superbike Champion - and seven times World Champion in total - Fogarty needs little introduction to road race fans with the Blackburn rider having made his name at the Isle of Man TT before sweeping all before him on the World scene. Fogarty won three TT races in 1989 and 1990, including a Formula One-Senior double at the latter, and took seven podiums in total, firmly recognising the part the island played in his success. Scots ace Simpson was born into a racing family with his father Bill - who will also take part in the lap of honour - a former race winner. Ian was just 17 when he first tackled the Mountain Course at the 1987 Manx Grand Prix and he went on to become one of the best road racers of his generation with multiple wins at both the TT and North West 200. A complete all-rounder, he was also a multiple British Champion until injury cut short his career when still at the peak of his profession. Another rider from the generation of flying Scots in the 1980s and 90s, Morrison, like Simpson, was a multiple British Champion with his crowning moment at the TT coming in 1988 when he won the Production C race. A year later, he became the second man ever to lap the Mountain Course at more than 120mph moments after Steve Hislop had achieved the feat and although he called time on his TT career in 1991, he did so with seven podiums to his name. A former British Champion, Parrish rode for the Heron Suzuki team in the 1970s before switching to Yamaha in the 1980s, with his best TT coming in 1984 when he finished fourth in the Production race and eighth in the Senior. He went on to manage the official Loctite Yamaha team before forging a successful career within the media. A road racer of the highest order, Law won the Manx Grand Prix in 1979 before moving on to the TT and he soon claimed wins in the Junior races of 1982 and 1983 riding the Waddon and EMC machines. He also took second in the 1983 Senior Classic on a 500 Yamaha but injuries sustained in a short circuit crash at Brands Hatch later that year ultimately meant his glory days were behind him. The first American to have ever won a TT, Classic race exponent Roper took the 1984 500cc Historic race and will be back on the island riding a 500cc G50 Matchless for Team Obsolete. Although he never raced at the TT, Hodgson had considerable success at Oliver's Mount, Scarborough and Aberdare Park before going on to become 125cc British Champion. That led to a three-year spell in GPs although he's best remembered for his time in the British and World Superbike Championships winning them in 2000 and 2003 respectively. Spent several years in the American Superbike Championship and retired due to injury in 2010, now having a successful media career. Other star riders taking part in the Lap of Honour include 1985 Production TT winner Mat Oxley, Bill Simpson, Ian Richards, Malcolm Wheeler, Denis McCullough, Steve Linsdell, Glen English, Nigel Rollason and Gary Carswell. 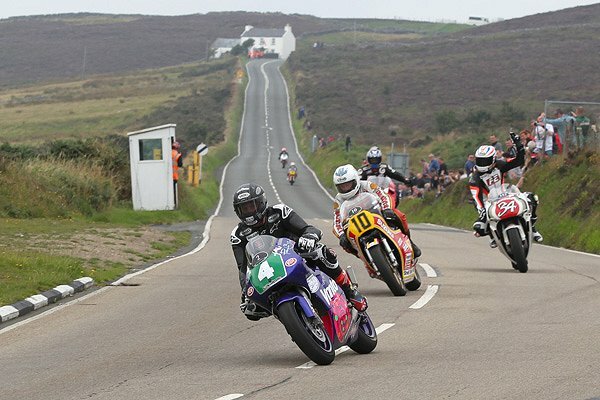 http://www.iomtt.com or by phoning 00 44 (0)1624 640 000.
at the Creg Ny Baa during the 2013 Classic Racer Lap of Honour.